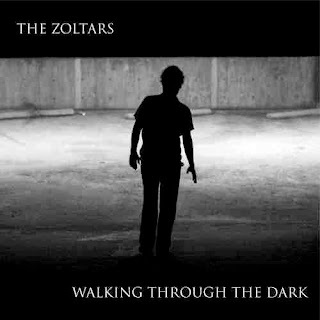 Jared from The Zoltars is a master of simple melody, he knows exactly how to slowly reveal the tracks on "Walking Through The Dark" without great fanfare in an attempt to seem smarter than everyone else in the room, even if he is. This album has much more space than his pervious full length Should I Try Once More. There’s a much grander sense of space, his themes continue to explore everyday and mundane but this underlying huge sound builds like a backwards ripple growing larger the more time passes. It's just not a happy record. The Zoltars wallow in those mellow feelings of depair without getting morbid - far from it - they seems to be able to be ok with sharing this internal battle ending up with great tracks from doubt and failure. “Here In My Room” begins the album with a lament to staying inside - and he’s torn, like most sentiments on this record. The narrator knows it's good for him but he still can’t bring himself to get out the door. Jared makes it sound great though, his solemn piano strikes echoing throughout this space. The massive guitars and chorus feel like an internal revelation. This becomes important, this simple act of leaving a house is a labored over decision. Nothing can be taken lightly and the first track places this far away from the carefree summer pop caregory, far away from lush psych harmonies and fuzzy guitars. "Fear Not Death" is their trademark somber sound. The way this vocal is distanced and barely sung as if he's going to make the absolute least amount of effort to deliver this. The melody is strong and thought out but he’ll be damned if it's going to be given up that easily, giving you all the clues you need. He's harmonizing with himself in the haziest slow motion blur psych rooted in the Velvet Underground repetition. Picking abnormal rhythms and sticking them out long enough until they're something else. "Don't Want You To Go Away" opens on a slow, brushed electric with long reverb piano strikes that are so specific to them. There’s no one else that would go straight for this forlorn sound nailing down this unique take on melancholy. Like a goth Real Estate The Zoltars are a textbook example for not blasting away as fast and hard as possible to evoke emotion. He's got me second guessing all kinds of punk records, his fragile vocal almost disappearing in these melodies. He can do incredible things with hardly anything, the sign of a great songwriter. Every instinct is to pour it on and he takes it all away. "I Was Outside" finally makes it out the door, hardly singing with the instrumentation drowned into the background. Gently pressed keys on a piano and the backup vocal fades in not breaking in on the moment. You're leaning in - "All my favorite people are dead?" You get that feeling like on Antenna to the Afterworld, this record can't help but avoid the gushing, flowery psych and embrace a dark place that's inspiring even if it’s not going to get you out of bed. You just want to stay under Jared’s smothering, heavy warm blanket. The last track, "Walking Through The Dark" is a lullaby, an old folksong that sums this all up, and I'm talking about more than just a record. Sometimes you are just that clueless, jumping headfirst into a relationship or starting a family. And you have to move forward blindly, not thinking about it too much. It's not faith, I don't get a religious sensibility from the Zoltars, I don't think they think there’s a higher power at work it’s instead looking inside to find the things that keep you going every day. Get this from CQ Records.